Ultimate Halloween and fall season treat with your favorite candies! Get all your fall favorite tastes with these semisweet chocolate morsels, reese’s pieces, pumpkin spice morsels and pecans! Sweet tooth here we go! Bring. It. On. Yep – I have a bit of a sweet tooth over here. Which is perfectly ok in my book! Life is short so I indulge in my favorite things from time to time, especially during the fall season!! And chocolate…oh my love for chocolate. It’s one of my all time favorite things! Oh…by the way, what was your absolute FAVORITE candy growing up? Come on…we all had one! Mine was Caramello candy bars…YUM!! All that chocolate and creamy caramel…I haven’t had one in years! I also loved reese’s pieces. When’s the last time you had reese’s pieces? No, not reese’s peanut butter cup (although those are also uber delish)…I’m talking about reese’s pieces! I bet it’s been awhile for you too, huh?! Well, you know what that means. It’s time to go grab a bag and make yourself the absolute BEST Halloween Candy Bark for this upcoming fall season! You might be saying…”Hold on, Amanda….the BEST? That’s a strong statement. The BEST is hard to define. It’s quite subjective” Well, you’re not wrong…but I’m claiming this candy bark as the best because I took this platter of yumminess to my office and BAM – it was gone so fast! I had so many people pass me in the hall or send me a message and said, “Holy cow – that was the best sweet treat!” and “Oh man, that was the best fall bark ever! I tasted all kinds of fall flavors in t here!” So yep – we’re going to run with the BEST! We start with lining a quarter cookie sheet (9×13) size with aluminum foil. Grab your favorite saltine crackers and lay them in order one-by-one so they are touching. Your cookie sheet should look like this when you’re done laying down the crackers. A nice tight cookie sheet with crackers right beside each other. You want them touching, but not overlapping. Next, it’s time to make the homemade caramel sauce. Take the margarine, butter and brown sugar and dump them into a large pot. Place the pot on top of the stove and turn it to medium-high. Also, this would be a good time to go ahead and preheat your oven to 400. When the brown sugar, butter and margarine start to melt, they are going to start bubbling.Get that spoon ready because we are about to start stirring! You literally want your ooey gooey caramel sauce to stay at a rolling boil until it starts to get thick. Let this sauce boil for about 3 minutes, stirring to ensure it’s not sticking or burning. After the caramel sauce is at the consistency above, you’re going to pour it onto the tray of saltine crackers. Then, you’ll take your spatula and spread the caramel sauce as evenly as possible onto the crackers. Make sure you spread kinda quickly because the caramel sauce starts to thicken up and solidify. Now that you have the caramel sauce spread evenly, put the cookie sheet of crackers and caramel sauce into the pre-heated oven. Your goal here is to let the caramel get hot and bubbly just like it is here below. this usually takes about 5 minutes so keep your eye on this process so it doesn’t burn! Once the caramel is hot and bubbly, pull the cookie sheet out of the oven and pour on your semisweet mini chocolate chips, reese’s pieces, pumpkin spice morsels, pecans chips and sprinkles. Spread them out as evenly as you can with your spatula. This means mixing and swirling all those candies into the ooey gooey caramel sauce. Our goal here is to combine all these yummy candy flavors while they start to melt. Pop the cookie sheet back into the oven for another 3-5 minutes or until the semisweet chocolate morsels start to melt. Keep in mind, the reese’s pieces and pumpkin spice morsels won’t completely melt. That’s ok! Once the chocolate has started to melt, you’re ready to pop this cookie sheet into the refrigerator for about 1-2 hours. We need the bark to get cold and become hard. Once the candy is hard, it’s ready to break! You’re going to take your hands and start pulling up the bark and breaking it into pieces. Divine, right?!? And that’s it…LITERALLY DONE! You can switch up the candies!! Don’t like chocolate, but you like white chocolate? No problem! Switch out those semisweet morsels for white chocolate chips! Get the mini ones if you can because they melt faster! Are you gluten free? No problem! Use a gluten free saltine cracker like Schar Naturally Gluten-Free Table Crackers! Switch up those candies to make this recipe your own! I used these Nestle Pumpkin Spice Toll House Morsels because they taste like fall to me, but use whatever candies you want! I’m been known to make a batch of this Halloween Candy Bark with mini M&Ms! Oh…and these M&M’s Candy Corn White Chocolate Candies are also pretty fabulous! This bark is sweet so if you want to cut some of the sweetness out, you can use a dark chocolate morsel like these Nestle Dark Chocolate Morsels. Adding in pretzels sticks help cut the sweet, as well. When you’re breaking the bark, make sure you tear off any stubborn aluminum foil. It likes to stick to the bottom of the caramel and crackers. If you have a flexipan, use it when making this bark. Makes your life SO much easier! My sister introduced this bark to me several years ago and she called it “Krack Kandy” because it’s seriously very hard to put down. Kind of addictive. 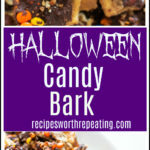 But I just couldn’t move forward with that name, so that’s why I’ve named this one Halloween Candy Bark. So if you’ve heard of “Krack Kandy” or “Crack Candy” – this is the recipe. It may be easier to use Parchment paper or a silpat than using aluminum foil. Since my sister taught me how to make this years ago using aluminum foil…I’ve kept that practice in place. But use whatever method you choose! There you have it oh my goodness are you not so excited to go make this for yourself?!? Then go…but make sure to come back and tell me know you liked it and all the fun variations you tried!! What Other Fall Sweet Treats Do You Recommend? Did you find this blog post and these step-by-step instructions helpful? If you’ve tried my Halloween Candy Bark or any other recipe on the blog then don’t forget to rate the recipe and let me know how it turned out in the comments below! I love hearing from you! You can also sign up for my newsletter and FOLLOW ME on FACEBOOK, TWITTER, INSTAGRAM and PINTEREST to see more delicious food I’m creating! Ultimate Halloween and fall season treat with your favorite candies! Get all your fall favorite tastes with these semisweet chocolate morsels, reese's pieces, pumpkin spice morsels and pecans! Line a 9x13 cookie sheet with aluminum foil. Place saltine crackers side-by-side until the cookie sheet is filled. Set aside. Get out a large pot and melt on medium high the stick of butter, margarine and dark brown sugar. Bring the caramel sauce to a rolling boil for about 3 minutes while stirring to ensure no sticking or burning. After the caramel sauce has boiled for about 3 minutes, pour evenly onto the saltine crackers. Take a spatula and spread the sauce evenly onto the crackers. Place the cookie sheet into the over for about 5 minutes, or until the caramel sauce starts to boil. Pull the cookie sheet out of the oven and evenly distribute the semisweet chocolate morsels onto the boiling caramel sauce. Add in the reese's pieces and pecan chips. Take your spatula and spread evenly so the candies start to melt. Place the cookie sheet back into the oven and let cook, just long enough for the chocolate to melt. Once the semisweet chocolates have melted, remove the cookie sheet from the oven and place in the refrigerator for 1-2 hours. Once the bark has completely cooled and is cold, remove from the refrigerator and start to break the bark into bite size pieces. Store either in the refrigerator or in an airtight container on the counter. It may be easier to use a Flexipan, Parchment paper or a silpat rather than using aluminum foil. Halloween? Already? Ok. Cue the Jason & Michael Myers movies, if I must! And this bark, too. I would devour a bowl of this! Halloween is my favorite holiday so nothing excites me more than seeing candy recipes fo my favorite day!!!! #doihavetogiveoutallofthecandy? I still have candy left over from last years Halloween! LOL So this is a great way to use it up and we all can enjoy it! These look like such great treats to share with friends or neighbors. But man, I am so not ready to think about Halloween yet!